Costco, whose CEO is a prominent Democratic Party fundraiser, will directly benefit from the 40 percent minimum wage increase proposed by Sen. Tom Harkin (D., Iowa) and embraced by the president in his State of the Union address. The wage hikes will not impact Costco, whose employees’ starting wage is more than $11 per hour, but it will drive up the labor costs for nearly all of Costco’s competition. Michael Saltsman, research director at the Employment Policies Institute, sees self-interest, rather than altruism, at work. "If the wage mandate was set much higher—at say, $25 an hour—and it was cutting in to Costco’s business, you can be sure they’d be up in arms about it," he said. 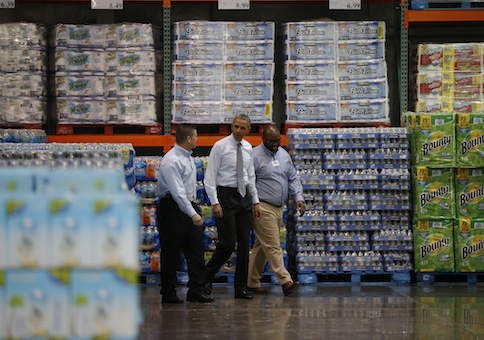 Costco’s high pay scale made the company a natural setting for President Barack Obama’s Wednesday morning speech on the minimum wage and stagnant wages. He reiterated his State of the Union message of driving up wages through regulatory and legislative action from a Maryland Costco location. "There are a lot of Americans who don't work somewhere like Costco, and they're working for wages that don't go as far as they once did," he said of the wage hike. "I'm going to do it, with or without Congress." Costco CEO and close Obama adviser Craig Jelinek has been a longtime supporter of minimum wage increases. He personally signed the Business for a Fair Minimum Wage (BFMW) petition, which calls on the federal and state governments to boost wages. "At Costco, we know that paying employees good wages makes good sense for business," Jelinek said of the BFMW petition in 2013. "Instead of minimizing wages, we know it’s a lot more profitable in the long term to minimize employee turnover and maximize employee productivity, commitment, and loyalty. We support efforts to increase the federal minimum wage." The vast majority of retailers do not share Jelinek’s optimism about the economic benefits of increased labor costs. The National Retail Federation, the nation’s largest retail trade association, said that the president’s minimum wage agenda would translate to "minimum opportunities." "If you want to create minimum opportunities, then raise the minimum wage," NRF President Matthew Shay said in a press release. "We welcome the president’s focus on the economy and jobs, but a minimum wage hike runs counter to that goal." "Raising the minimum wage would place a new burden on employers at a time when national policy should be focused on removing barriers to job creation, not creating new regulations or mandates. It’s simple math—if the cost of hiring goes up, hiring goes down." Shay added that the president’s agenda was a solution in search of a problem since only 5 percent of retail workers earn the minimum wage and many of them will see their wages increase as they gain more experience. "It’s really a starting wage that allows teenagers or others with little job experience to enter the workforce," he said. "A mandated hike in labor costs would negatively impact businesses that employ people in entry-level jobs and ultimately hurt the people it is intended to help." Saltsman said that President Obama’s attempt to force all retailers to adopt Costco-esque pay policies would have a negative effect on other retailers that operate on different business models. A key factor to Costco’s profitability, for example, is the fact that the retailer does not employ as many people as its competitors. "Costco is able to offer lower prices and better values by eliminating virtually all the frills and costs historically associated with conventional wholesalers and retailers, including salespeople, fancy buildings, delivery, billing, and accounts receivable," Costco co-founder and DNC speaker Jim Sinegal said. "We run a tight operation with extremely low overhead which enables us to pass on dramatic savings to our members." Saltsman said that other companies would employ fewer people if President Obama’s wage hike goes into effect. "The company brags about all the ‘frills’—including salespeople—that it has eliminated," he said of Costco. "The company has a profit-per-employee that’s two to three times greater than a restaurant or grocery store—and can afford a higher starting wage while others can’t." This entry was posted in Issues and tagged Barack Obama, Minimum Wage, Tom Harkin. Bookmark the permalink.